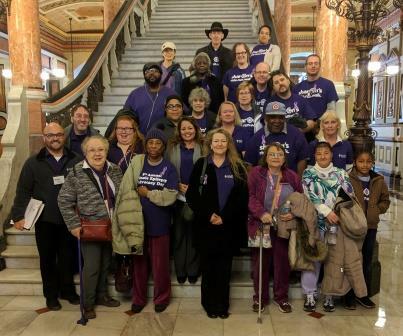 As a part of our ongoing advocacy for epilepsy education, research and funding the Epilepsy Foundation of Greater Southern Illinois along with the Epilepsy Foundation of Greater Chicago, the Epilepsy Foundation of North Central Illinois, Iowa Nebraska, and many individuals with epilepsy and their loved ones throughout the state donned their purple and participated in the 6th Annual Epilepsy Advocacy Day in Springfield. Before we all set off to meet with our policy makers, we gathered in the rotunda at the State Capital for a group picture. From the group picture, we all set off to educate our policy makers on the importance of epilepsy funding, research, and education. Not everyone knows that 1 in 26 people will be diagnosed with epilepsy in their lifetime, but with the support of our entire epilepsy community and policymakers we are confident that epilepsy awareness will become as common as the disorder.